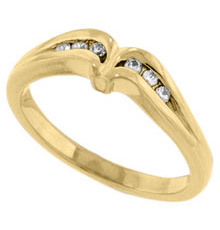 This is a 18k yellow gold fancy shaped 3.5mm woman's diamond band. There are two .019 and four .015 carat diamonds with a color of G-H and a clarity of VS for a .10 total carat weight. This is part of a Danforth matched set.